Home / Movies / Sink Baby, Sink! Laura Giglio stars as a prostitute/model who is very difficult to work with. But unknown to her, the photographer (GW Lawrence) is a serial killer with a very dark secret. 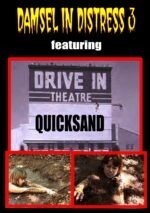 A secret she learns after being pushed into quicksand and left completely helpless! (20 min.) Bonus: Behind the scenes clips.